Black and white bulls met a strong demand selling to a top of 6,700gns at Holstein NI’s 30th annual autumn show and sale, hosted by Taaffe Auctions at Dungannon. Following brisk bidding for the entire catalogue auctioneer Michael Taaffe confirmed that 30 bulls were traded to level at £3,820 per head – setting a centre record for Holstein bulls at Dungannon, and representing an increase of £985 on last year’s sale. Top price at Holstein NI's 30th autumn show and sale in Dungannon was the 6,700gns Prehen Lerwick ET PLI £567 bred by Stuart Smith, Londonderry.He was congratulated by Stephen McKenna and Steven Gilkinson, Gortavoy Feeds, sponsors. Topping trade at 6,700gns was the PLI award winner Prehen Lerwick ET GPLI £567 from Robbie and Stuart Smith’s herd at Londonderry. This eighteen-month-old entry was sired by Sandy Valley Penmanship, and is bred from Prehen Shamrock Lady ET VG SP who produced over 11,700kgs at 4.19% fat in her third 305-day lactation. After spirited bidding he was secured by GR Gilmore from Portaferry. Prehen bulls sold readily with five lots averaging £4,284 each. The Smith’s realised 4,700gns for the June 2016 Prehen Frites PLI £580. Also by Penmanship, he is backed by nine generations of VG and EX dams from the herd’s noted Froukje family. His dam Prehen Justice Froukje ET VG89 5* is a former number two PLI cow in the UK, and a full sister to the high ranking UK proven sire Prehen Omen. She averaged 10,450kgs at 4.12% butterfat and 3.33% protein in six 305-day lactations. Buyer was R Murphy from Derrynoose, Armagh. Second highest price of the day 5,900gns was paid to Ronald McLean, and sons Malcolm and Barry, from Donaghmore, for the fourteen-month-old Relough Alert PLI £530. Sired by De-Su Acrobate ET, he is bred from Relough Iota Amy EX SP who produced 13,903kgs at 4.60% butterfat and 3.44% protein in her third lactation. Backed by seven generations of EX dams, he sold to Leslie Glenn and Sons from Carryduff. Following close behind at 5,750gns was the pre-sale show champion Relough Dasher PLI £438. Born in September 2016 he was sired by Sandy Valley Penmanship, and is bred from Relough Barney Danna 7 ET GP84-2yr. His maternal grand dam Relough Goldwyn Danna EX92 gave 12,360kgs at 5.13% butterfat and 3.34% protein in her third lactation. Buyer was Robert Rainey from Beragh, County Tyrone. Next best at 5,150gns was the fifth placed Relough Furlong PLI £525. At thirteen-months he was the youngest bull catalogued and sold to William Magee from Larne. Also by Penmanship, he comes from ten generations of VG and EX dams. His dam Relough Legend Frances EX92 2E LP 50 averaged 11,877kgs at 4.42% butterfat and 3.58% protein in four 305-day lactations. The McLean family’s Relough herd sold eight bulls to average £3,918 each. Wesley Gordon sold the July 2016 Annalong Penmanship ET PLI £533 for 4,800gns. Another by Penmanship, this one was runner-up for the PLI award and is bred from Laurelhill Roxell Fay EX92 4E LP80 – bought at the Laurelhill dispersal for 5,600gns in 2013. Backed by seven generations of VG and EX dams, he sold to Andrew Wilson from Templepatrick. 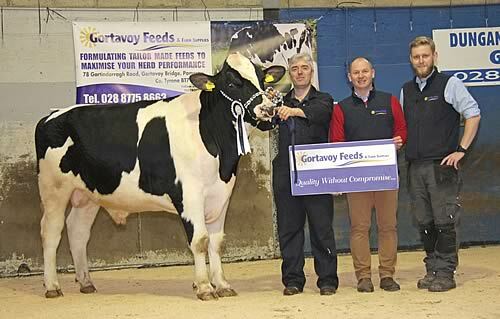 William and Andrew McCollum from Coleraine sold six bulls from their noted Ballycairn Herd to average £3,552 per head. Leading their offering at 4,600gns was the July 2016 Ballycairn Lavaman Lincoln PLI £415. This second prize winner was sired by Gen I Beq Lavaman, and is bred from seven generations of VG and EX dams. His dam is Ballycairn Maestro Lizanne ET EX92 2E LP60. Buyer was William McCormick from Ballycastle. Also selling at 4,600gns was the honourable mention award winner Ards Louis PLI £369 from the Patton family’s herd in Newtownards. This August 2016 Topcroft Pesky Trix son is backed by thirteen generations of VG and EX dams, and sold to William Armstrong from Crossgar. Three Ards bulls averaged £4,217 each. The Inch Genetics partnership secured a bid of 4,400gns for the reserve show champion Inch Pen PLI £394.This eighteen-month-old Penmanship son is bred from Inch Calano Daphne EX93 5E who averaged 9,086kgs at 6.07% butterfat and 3.37% protein in six lactations. This one was snapped up by Cyril Maxwell from Augher. R and S Smith, 4,100gns for Prehen Frugal PLI £528. S and J McCormick, 4,050gns for Hilltara Policy ET PLI £229. W and A McCollum, 4,000gns for Ballycairn Nadal Horizan PLI £499. Class 1, bull born between 15/04/16 and 08/07/16 – 1, Inch Genetics, Inch Pen; 2, W and A McCollum, Ballycairn Lavaman; 3, R and S Smith, Prehen Whistler. Class 2, bull born between 09/07/16 and 03/09/16 – 1, H Patton and Sons, Ards Louis; 2, W and A McCollum, Ballycairn Penmanship Charley; 3, WD Gordon, Annalong Penmanship ET. Class 3, bull born between 03/09/16 and 17/10/17 – 1, R McLean and Sons, Relough Dasher; 2, W and A McCollum, Ballycairn Nadal Horizan; 3, H Patton and Sons, Ards Sweeney. Class 4 – PLI – 1, R and S Smith, Prehen Lerwick ET; 2, WD Gordon, Annalong Penmanship ET; 3, R McLean and Sons, Relough Delectable ET.